Rockman Corner: Happy 20th Anniversay, Rockman 4! Happy 20th Anniversay, Rockman 4! One of my personal favorites turned 20-years-old today. 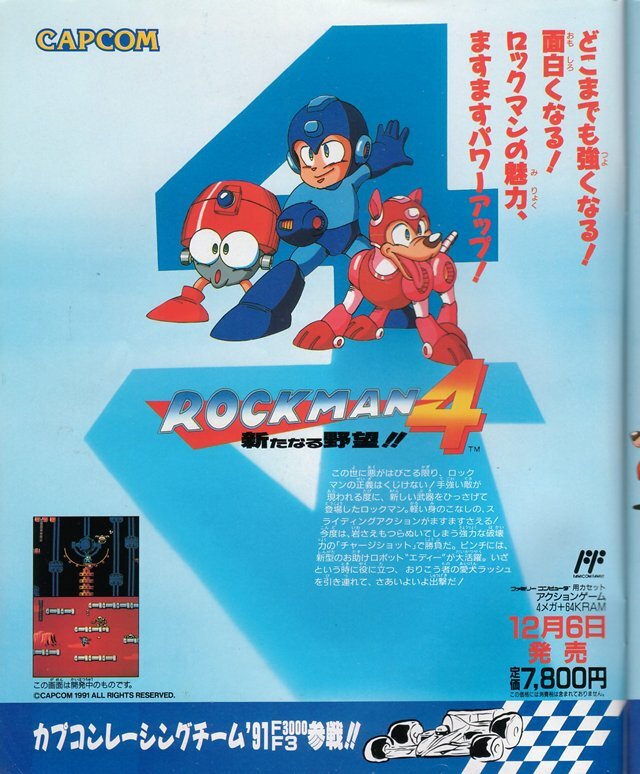 Rockman 4 blasted onto store shelves in Japan on December 6th, 1991. Fans are split on where they stand with Mega Man 4. Some love it to pieces, others despise it. The love/hate relationship is rooted in MM4's gameplay; an attempt to push the franchise's gameplay into new territory. This ambition, alone, would go on to create a rift in the fanbase. You came out of Mega Man 4 either embracing the changes, or left with a bad taste in your mouth. The presence of the Charge Shot in particular seems to be the instigator -- to some, it's an excellent addition to the tried-and-true gameplay. To others, it was a game breaker; an anomaly that disrupted a formula that wasn't broken to begin with. And then there's the wide range of diverse opinions about level design, Robot Masters, weapons and plot. It goes on and on, really. Again, you either love it or hate it. Truly, I fall into the former. To me, MM4 pushed the boundaries -- tried some new things and, for the most part, succeeded. At its core, Mega Man 4 offers enough variation from its predecessors to be unique. Familiar challenges boasted some new twists, the story (initially) threw us for a loop, menu screens were streamlined and slick, and two sets of solid castle stages helped make MM 4 into one of the longer adventures. Oh, and the music. Yummy stuff. Most of the tunes are diverse and fairly catchy. To this day, I often find myself finger or foot tapping to the beats. While not my all-time favorite Mega Man game, Mega Man 4 does rank highly on my list. By no means is it perfect -- some aspects could have used some extra polish, but as a whole, Mega Man 4 stands proud as the underdog. And hey, I think we can all appreciate MM4 for introducing us to Eddie -- that lovable walking suitcase. So take some time today to reflect on Mega Man 4. Of course, feel free to share your thoughts in the comments! The charge shot was ok. New threat that wasn't Wily? Not bad. But EDDIE...That is the real reason Mega Man 4 is rad. Happy 20 years, fliptop! I'm definitely part of the "love it" crowd. It's my personal favorite of the Classic series. I wouldn't say it's the best game in the series, but it's the game I have the most fond memories of. I'll probably play through it again tonight to celebrate the 20th anniversary. 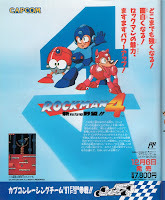 Anniversary for Rockman 4 ? Really ? Where was an Anniversary for Rockman 1,2, and 3 in your news ? ...it was an amazing feeling. I think we then read the instruction book later, and discovered how to use it was there lol. I like Mega Man 4. Wasn't there already a charge shot in MM3? Unless the one in MM4 was an updated form of that, hm, maybe I'm getting a bit mixed up. Posting about this one in particular because this is a personal favorite. I annually post about RM 1 on the 17th (25th anniversary, as you know, is just around the corner). Talked about 2's a while ago. Admittedly, missed 3. Woop, I meant 24th. Getting ahead of myself there. I remember renting Mega Man games when I was a kid, but Mega Man 4 was the first Mega Man game I had ever owned. It brings so many good memories. I still pop in the cartridge now and then if I can get the NES to work, otherwise I just use the anniversary collection. Thanks for posting this up Protodude. MM4 is one of my favs because I loved the Charge Shot and the final Wily battle theme. Defintely in my top 3 classic MMs. No, that was the slide ability. The Charge Shot didn't make its debut until Mega Man 4. However, in Mega Man 2, the Atomic Fire could be charged. It's silly to say one NES Megaman is "bad" and others are "good", they're all basically the same engine. You wouldn't find the "bad" one bad if there was no point of comparison... So I say "good" and "better" instead. Megaman 5 was my first Megaman, and the one who made me a fan, so when I went back and played MM4 a few years later it felt very weird... the slim charged buster felt very uncomfortable. But playing it now, being able to see all of them in perspective, I like it a lot. I guess I love all NES Megaman games almost-equally now. I knew the Megaman fandom loathed most forms of change, but that far back? Damn. 4 was my first MM game, I rented it. My early childhood is extremely fuzzy. I don't remember much. But I remember Pharaoh Man on the cover looking all 'I'M GOING TO WRECK YOUR ****!'. And Ring Man was the first level I tried out, I remember the multi-color platforms and the hippos. Dust Man was just...weird. I think just seeing what the heck this abomination to robot construction and design would do was a major draw, too. Complaints about the Charge Shot are just unwarranted, at least in 4. The game made you use it wisely or suffer, and worked that into the boss patterns too. MM5-MM8, different story. This was a great game, and if I had to pick a favorite out of the original 6 NES games, it would be 4. 3 would take it, but the pacing is just awful. 4 introduced some wacky and wonderful RM designs, and new and interesting characters, plus, throw in some new gameplay features (Eddie, Beat, Grappler, new puzzles, etc.). Great game. Protodude, how could you not link to the game's intro! This was the first MegaMan game to have a real intro cutscene. That alone should lend it "landmark" status. I don't think it's the best in the series (and the game's ending was very weak), but it's still great. And the final Wily theme is a musical high-point of the series. I LOVE MM4. Definitely one of my favorites. The charged shot didn't bother me in the least. I mean, the Metal Blades were a HUGE game breaker in MM2 and yet critics and fans alike slobber all over that game (Yes, MM2 is one of my favs). I think one of best merits the classic series has is that all of its main titles...okay, except World 2...is that they're at the very least good games, something you wouldn't regret playing. The X series, on the other hand, anything after 4 is up to dispute. X5 had a lot of choppy design, X6 was horribly rushed, and X7 suffered massively from gameplay. X8 is debatable, also love/hate, but personally I felt it tried branching into way too many territories and ended up being unnecessarily gimmicky. Rockman 4. One of my favorites on the original console it came from, but my most favorite on the Complete Works collection. The music! Yasuaki Fujita was my favorite composer already, but it was even better when Minae Fujii lended her talents. And then, the music was vastly improved on with the Complete Works version, something I didn't think was possible in the first place! Ahh, MM4 still holds the most perfect title in the series. Other aspects might be better in other games, but as a whole, Megaman 4 is the most well-packed game. It was a huge success in Europe and Japan, just USA can't accept it for incomprehensible reasons. This is my favorite MM game, in fact, it was the first one i finished in my life. Viva Rockman 4!! PD: Yeah, i discovered the mega buster charging by just accident, because i rented this game (In 1992, obviously then no booklet included). Also, Skullman and Ringman destroyed me utterly.